§ 10. MEANWHILE this reverend servant of God, abandoning worldly things, hastens to submit to monastic discipline, having been excited by his heavenly vision to covet the joys of everlasting happiness, and invited by the food with which God had supplied him to encounter hunger and thirst in his service. 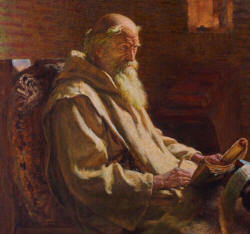 He knew that the church of Lindisfarne contained many holy men, by whose teaching and example he might be instructed, but he was moved by the great reputation of Boisil, a monk and priest of surpassing merit, to choose for himself an abode in the abbey of Melrose. And it happened by chance, that when he was arrived there and had leaped from his horse, that he might enter the church to pray, he gave his horse and travelling-spear to a servant, for he had not yet resigned the dress and habits of a layman. Boisil was standing before the doors of the monastery, and saw him first. Foreseeing in spirit what an illustrious man the stranger would become, he made this single remark to the by-standers: “Behold a servant of the Lord!” herein imitating him who said of Nathaniel, when he approached him, “Behold an Israelite indeed, in whom there is no guile.” I was told this by that veteran priest and servant of God, the pious Sigfrid, for he was standing by when Boisil said these words, and was at that time a youth studying the first rudiments of the monastic life in that same monastery; but now he is a man, perfect in the Lord, living in our monastery of Yarrow, and amid the last sighs of his fainting body thirsting for a happy entrance into another life. Boisil, without saying more, kindly received Cuthbert as he approached; and when he had heard the cause of his coming, namely, that he preferred the monastery to the world, he kept him near himself, for he was the prior of that same monastery. § 11. After a few days, when Eata, who was at that time priest and abbot of the monastery, but afterwards bishop of Lindisfarne, was come, Boisil told him about Cuthbert, how that he was a young man of a promising disposition, and obtained permission that he should receive the tonsure, and be enrolled among the brethren. When he had thus entered the monastery, he conformed himself to the rules of the place with the same zeal as the others, and, indeed, sought to surpass them by observing stricter discipline; and in reading, working, watching, and praying, he fairly outdid them all. Like the mighty Samson of old, he carefully abstained from every drink which could intoxicate; but was not able to abstain equally from food, lest his body might be thereby rendered less able to work: for he was of a robust frame and of unimpaired strength, and fit for any labour which he might be disposed to take in hand.